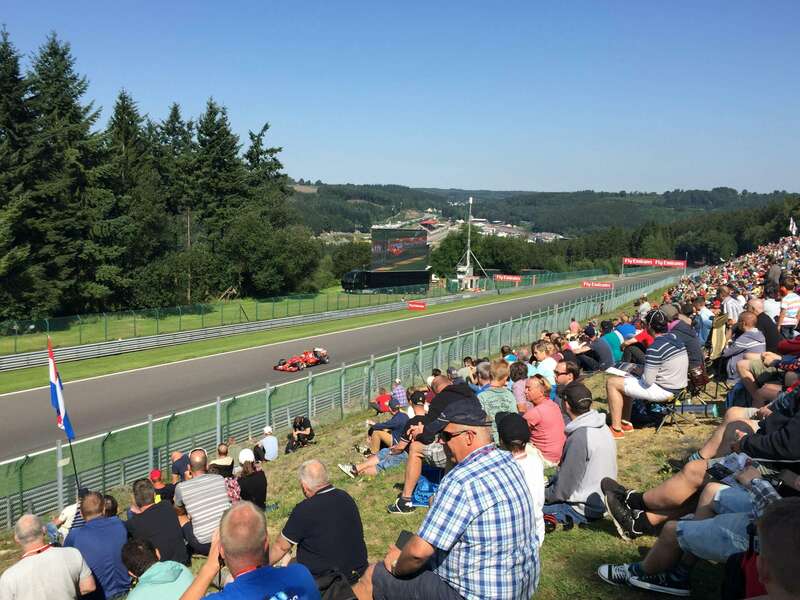 Thirteen years after our first visit, we returned this year to the Spa Francorchamps circuit for our second Belgian Grand Prix. 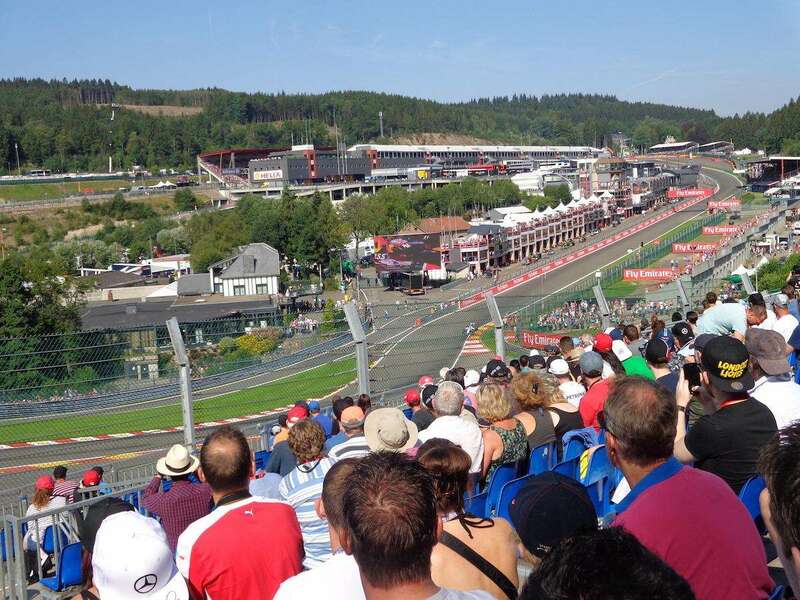 The Ardennes forest was bathed in warm sunlight and the fan experience at this iconic F1 circuit remains one of the finest on the current calendar. Our trip began in Paris on Wednesday evening, where we picked up a hire car and drove the 100km or so to Reims. After spending the night in an interesting, F1-themed hotel, we visited the historic Reims-Gueux circuit and had lunch in Luxembourg, before arriving at Spa just in time for the fan’s pitlane walk. Work commitments meant we had to return to Paris on Saturday evening and miss the race. Nevertheless, we still managed to make the most of our time at Spa. The fan’s pitlane walk was only supposed to be for 3-day ticket holders (i.e. 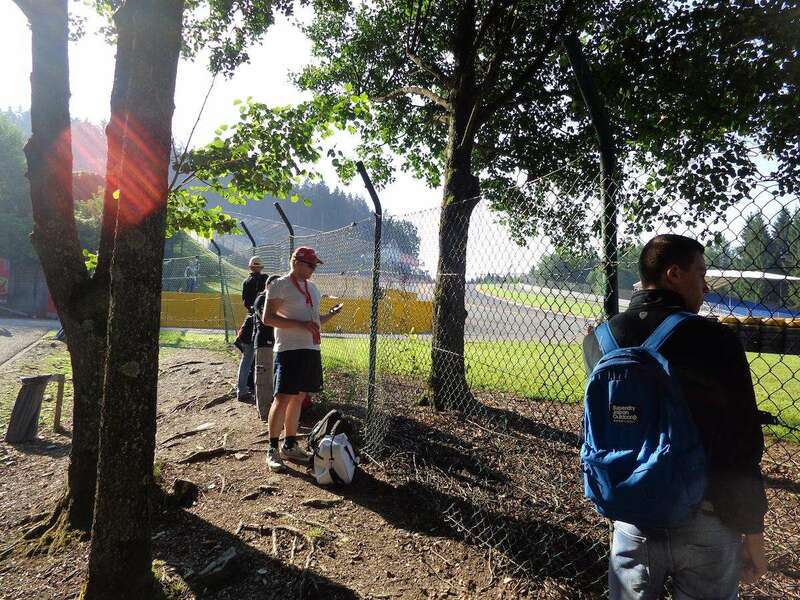 not us), but we joined the non-insignificant queue of excited fans outside the La Source entrance to the circuit and managed to sneak in via a guard who wasn’t checking tickets too thoroughly (others were less fortunate.) As seems usual with such events, there were way too many fans for such a narrow area. The pushing and shoving was made worse when the drivers made an appearance. The fans who made it to the front first and stayed in one place were rewarded with pictures and autographs from their favorite drivers. 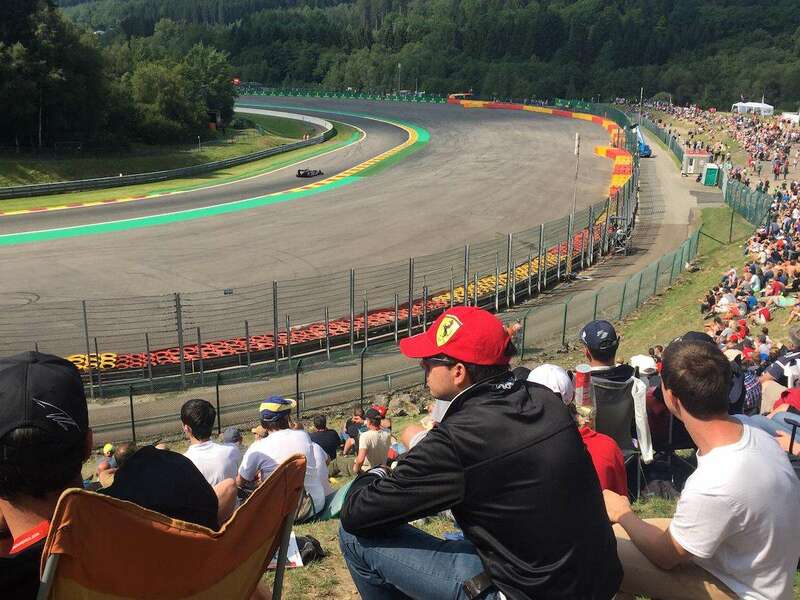 We bought a Saturday ticket for the Gold 4 (uncovered) grandstand in the middle of Eau Rouge, on the outside of the circuit. To be honest, the views from this grandstand were underwhelming. The catch fencing was high and the grandstand poorly positioned. We ended up spending most of the day back in General Admission! Arguably F1’s most famous corner, the elevation change as the cars go up the hill is much more dramatic in reality. 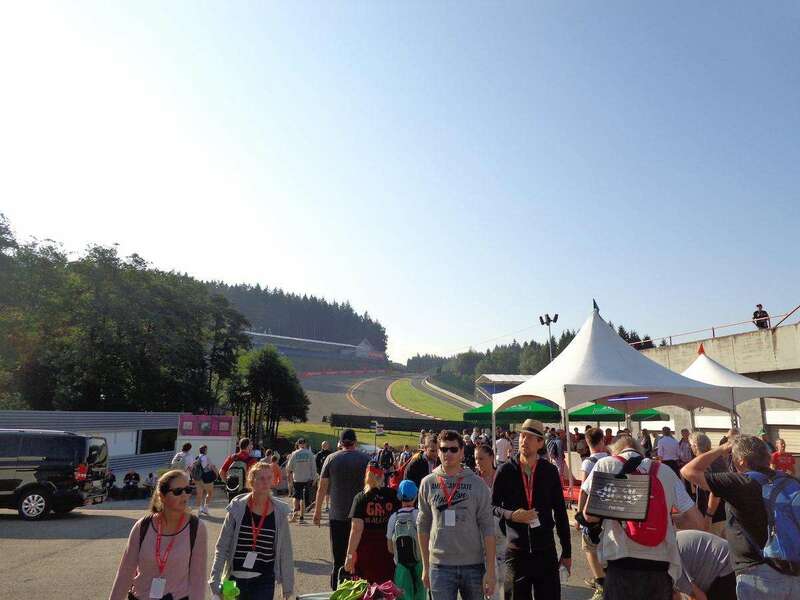 With a large concentration of grandstands and excellent general admission views, plus the best merchandise, food and drink close by, Eau Rouge is a great base for the weekend. There’s also an underpass in the middle of the corner to take you to other parts of the circuit. 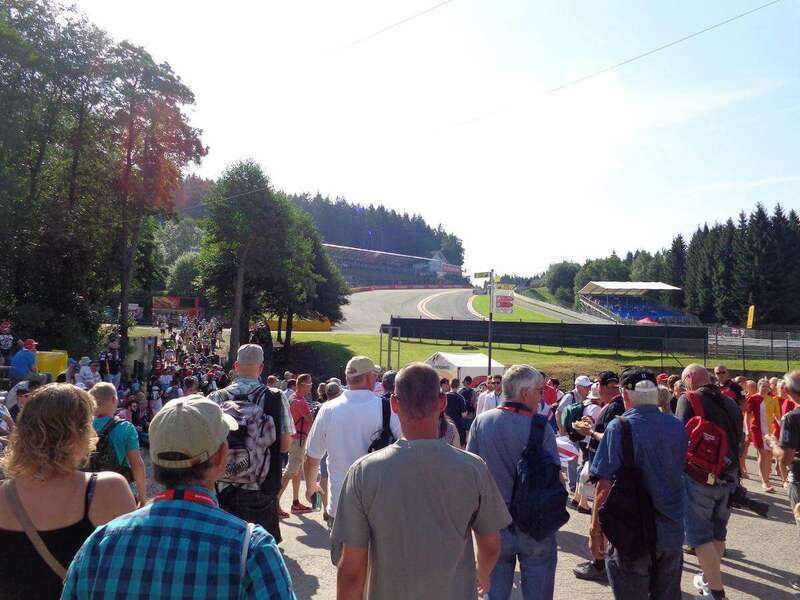 Once you have negotiated the steep path up the hill from Eau Rouge, you arrive at the area known as Raidillion. If you are lucky, there’s views of the cars emerging from Eau Rouge at high speed. The general admission area is quite limited here, and you’ll need to wait you turn (or get there very early on Sunday) to catch a glimpse of the cars through the handy ‘photographer’s gaps’ in the catch fencing. Once you get to the Kemmel straight, there’s much more room to find a vantage point on the side of the hill. There’s more fans closer to the Les Combes chicane, where many famous overtakes have happened over the years. This area at the top of the circuit was definitely our favorite places in general admission to watch the action. You can get really close to the cars as they take turn 10 at low-speed and it’s an excellent spot for amateur photographers, who were out in force. It’s a small area however and you’ll need to compete for a spot with the regulars who come every yea; get there at the crack of dawn if you want to see the race from this area. The panoramic views from the top of the hill at turn 11 down to Pouchon are also not to be missed. This is arguably the most popular general admission area at the circuit. 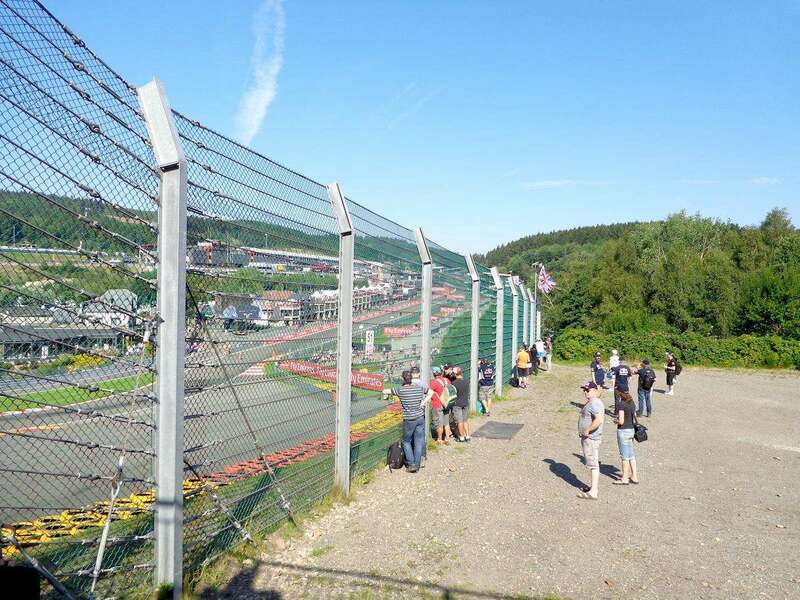 There’s plenty of room on the hillside for several thousand fans to watch the cars approach the tricky Pouchon corner. This is where Marcus Ericsson lost his Sauber during FP2 this year and hit the wall. The food and drink stalls at Pouchon are extensive, and the atmosphere is great. 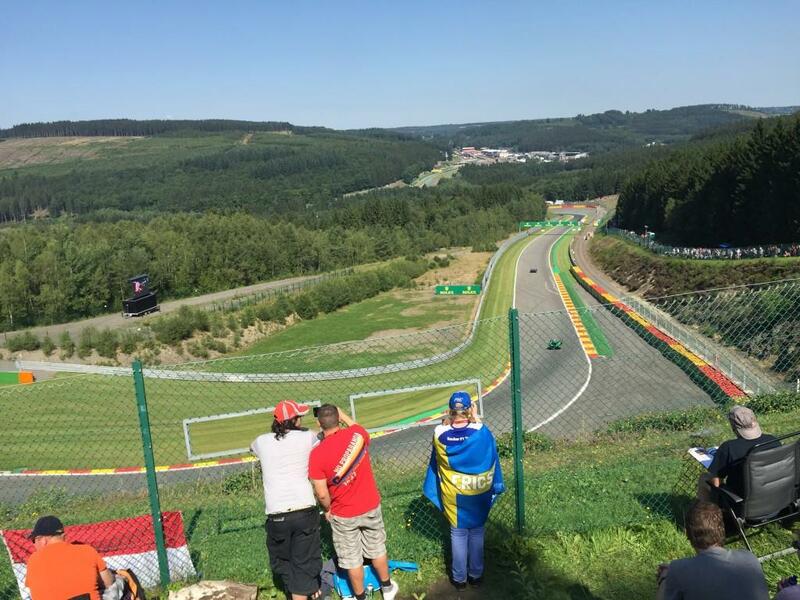 You can walk back to Eau Rouge via a flat, direct forest path in around 15-20 minutes. The Bus Stop chicane is another decent general admission vantage point, but there’s limited space to get great views, unless you fancy climbing a steep embankment. The views are also partially blocked by the Gold 6 covered grandstand. 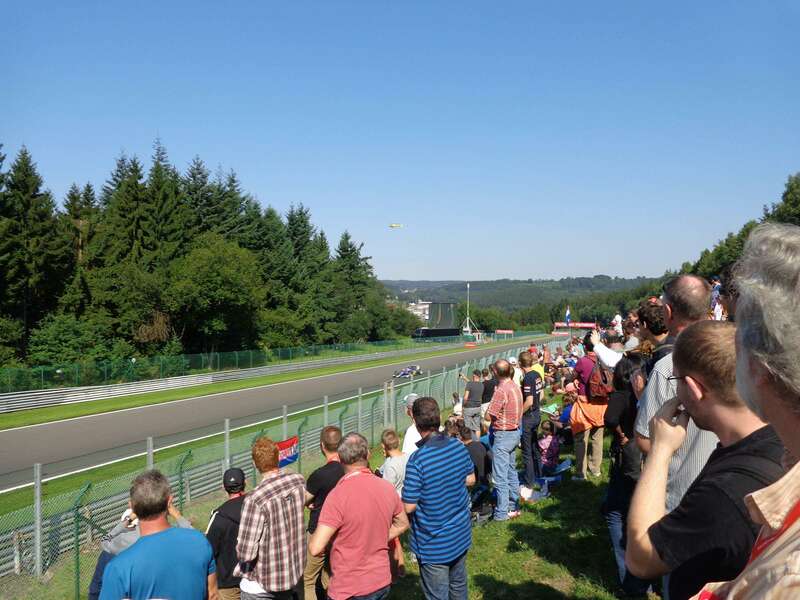 There are no grandstands on the high speed Blanchimont section of the circuit, and the views in general admission are limited to those from the path, which eventually leads below the circuit and emerges near the Les Fagnes area of the circuit, close to Pouchon. There is a grandstand here for young fans, but limited track views for everyone else. The biggest concentration of merchandise stalls, plus food and drink, can be found on the outside of the circuit near Eau Rouge. There is also good catering close to Pouchon, plus smaller food and drink stalls dotted around the circuit. 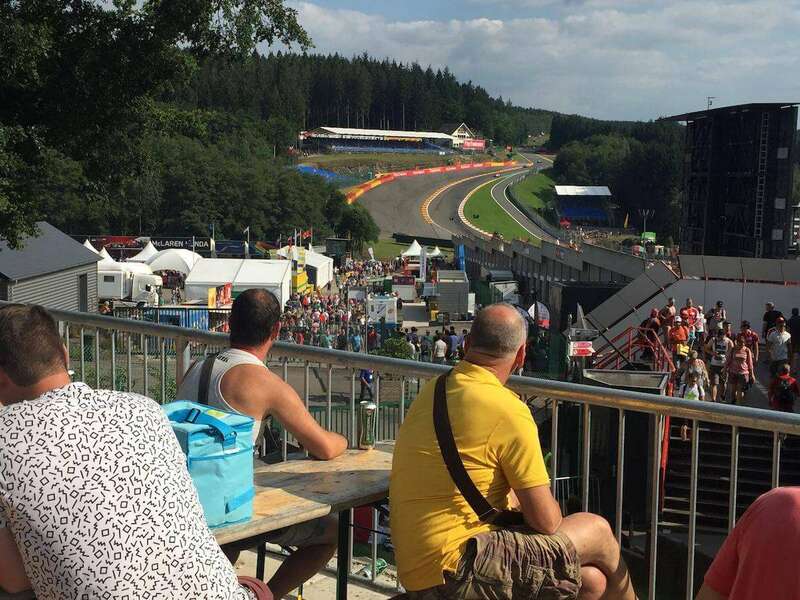 The prices for trackside F1 merchandise is uniformly expensive around the world; at Spa, you’ll pay €30 for a team hat, €40 for a t-shirt and €80 EUR for a shirt. Food and drink was disappointingly overpriced at Spa; water was €3 and a half-liter beer cost €5. Fries with mayonnaise were €4, hamburgers/hotdogs cost €6-7, and fish and chips or doner kebabs were €10. Luckily, there was limited bag searches on entry, so it’s no problem to bring your own food and drinks. There’s a handful of permanent and temporary toilet blocks, which cost €0.70 to use or free ‘porta potties’. It was possible to rent portable headphones with race commentary, which were priced at €50-65 and unsurprisingly, not too popular. The total cost of the trip for one person, not including flights, was approximately €665. The trip would have been cheaper for two people travelling together, and next time we would forget about grandstand tickets and go with general admission for the whole weekend. Unless you are camping trackside, we recommend hiring a car to get around. We stayed in the sleepy town of Banneux, around 25km from the circuit, and parked in the official yellow parking (well located close to the La Source circuit entry, but expensive at €20 per day.) We didn’t get stuck in traffic, but I imagine more patience is required on race day. If you want to save some cash, take your own food and drink into the circuit as trackside prices are high. 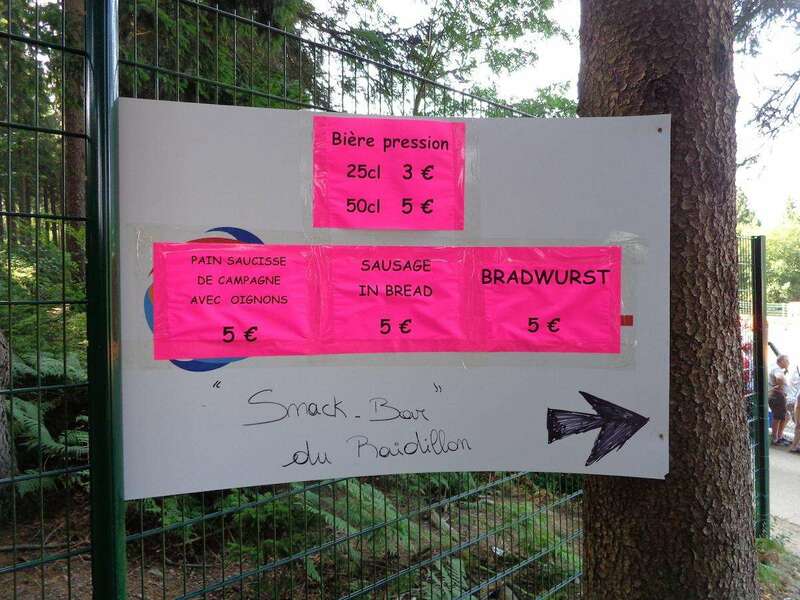 There is lots of cheaper food and drink available in the area just outside the circuit near between the Spa Francorchamps Racing hotel and the La Source entry. Wear comfortable shoes, especially if you are in General Admission. Regardless of your ticket type, you’ll still be covering a lot of ground getting into and out of the circuit each day. 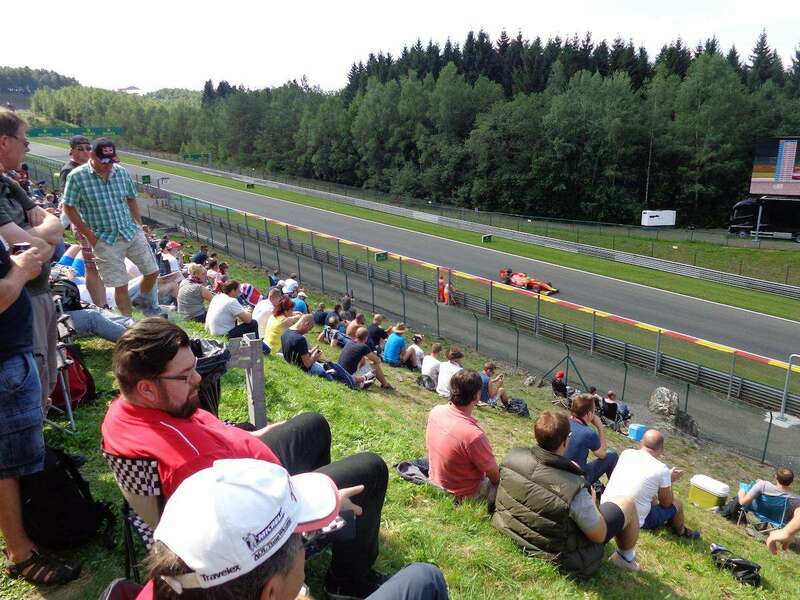 At around €110 for 3 days, the general admission (Bronze) tickets at Spa are excellent value. If you want to go for a grandstand, choose a covered one as the Belgian weather can be unpredictable. 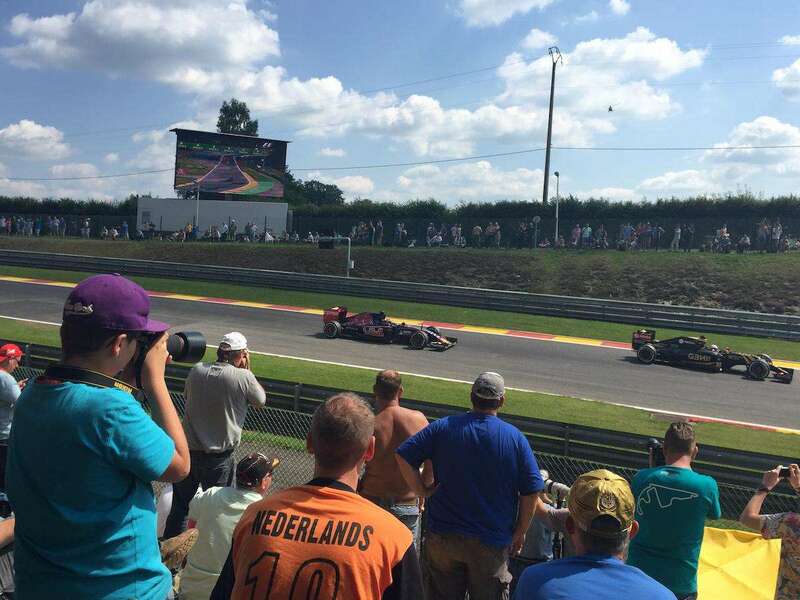 We will be publishing a ten-part travel guide to the Belgian Formula Grand Prix in 2016. In the meantime, tell us about your own experience.